It was Sunday, and there I was, sitting quietly reading the Boston Sunday Globe newspaper, when I read a simple sentence that sparked an idea. Has that ever happened to you in an odd moment? Can you see any issue with it? Yeah, me too. It’s unclear how many people are being mentioned, right? If Mary Smith is married to Bob Smith, Mark Jones is a separate person, which means there are three individuals there, and her husband is unnamed. If Mary Smith IS married to Mark Jones, he is her husband in the sentence, so there are only two individuals. Now, it’s doubtful that this sentence, as written, would bring down slings and arrows of outrageous fortune upon us, but it does show us that sometimes we need to use different punctuation marks to make our writing clear to our reader(s). 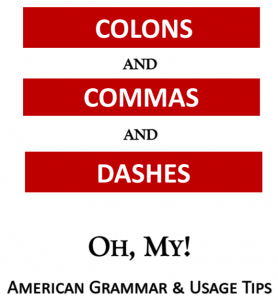 In my “Brush Up on Your American Grammar” workshops, I recommend not using too many pairs of parentheses (or braces, or brackets), because they’re HUGE marks and they draw attention to the information inside them, which is considered nonessential for sentence clarity. Those marks enclose information that could be left out of a sentence without major loss of understanding. So many readers will first read what’s inside them because the marks draw attention to themselves, and they’ll be reading the unimportant stuff. But using all commas, especially in the example above, doesn’t help at all. If you don’t know Mary Smith, and for whatever reason it’s important for you to know exactly who was there, that sentence will not help. As I see it, our job as writers is to be clear, especially with critical information. So be sure you’ve identified the persons or things clearly to anyone who might be reading your words. ← Active and Passive Voice Explained — Finally!